vSphere Replication 6.0 as a part of the vCloud suite and over the 5.5 release which has been detailed in this post and which has added a cloud replication should initially come out with a 5′ RPO, but this has been finally pulled out from the upcoming GA. So VR 6.0 will still have 15′ RPO. The product will be released together with the main release of vSphere 6.0 in Q1 2015.
vSphere replication is bundled with vSphere Essentials Plus and higher editions. 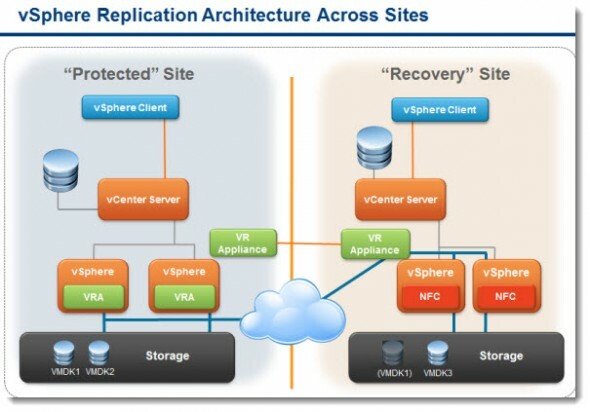 vSphere Replication 6.0 What's New? End to End compression – It's possible to enable compression to get better transfer times and reduce the consumed bandwidth. Typical compression ratios are 1.6:1 to 1.8:1. For example, a virtual machine containing 37.5GB of data took 52 minutes to replicate with compression off (default setting). With compression enabled, that same 37.5GB of replicated data was compressed to 20.2GB and took only 29 minutes to replicate. Isolate replication traffic from management traffic – VR 6.0 allows segregation of replication traffic which improves performance and security. The trafic types can be isolated at the source and target location. NIOC can be used to manage the replication traffic. Full Synchronization Performance Improvements – allocation information is requested from the underlying storage and checksum comparisons are done only where necessary (compared to previous release where it was done globally). Microsoft VSS support – VSS for Windows file systems are now supported. Quiescing Linux File system – there are “freeze” and “thaw” scripts and VMware tools to quiesce Linux FS. Quiescing improves reliability, but by default is disabled. Storage vMotion and Storage DRS support – No need to do a full synchronization after a replica VM was moved to different location, like in previous release. 10 VR appliances per vCenter – When deploying vSphere Replicatio, it's possible to deploy up to 10 vSphere Replication appliances per vCenter server. It's possible to configure VR for several VMs in the same workflow. Admin needs to specify VMs storage policy, RPO, VSS or Linux FS system quiescing and also network compression of replication traffic. Snapshots are not used (unless VSS is enabled). TCP port 31031 is used for the replication traffic. Once the initial replication done, the delta syncs are sent to the target site. The delta's are based on the RPO configure for the VM. RPO can be from 15 min to 24 hours. A VM which has been recovered has to be manually re-connected to the network after the recovery process is finished is necessary. Possibility to power on the VM after recovery is an available option. Note that VM with multiple recovery points is automatically recovered to the latest recovery point, but the admin can then revert to the point he wants to.